Hook style key cabinets store their keys suspended from hooks welded to the frame. These key storage units are suitable for key with large key tags or large heads. For instance , our Motor Vehicle Key Cabinets are hook style to accommodate the large FOBs used in today's new cars. 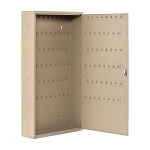 If you need to store a lot of keys in a smaller cabinet, our Slot Style Key Cabinets may be the answer for you. Remember that any cabinet with a key lock can be customized with one of our mechanical or electronic combination locks. Our main Key Cabinets & Storage page has a comprehensive list of many of our products, their type and capacity.